There has been a lot of excitement over a possible breakthrough on NAFTA based on a handshake agreement between the United States and Mexico. 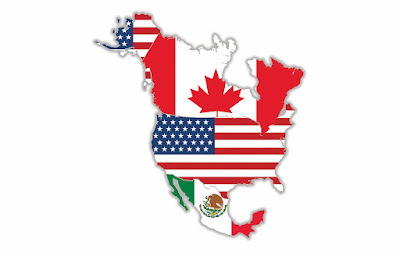 The White House has also positioned the deal as a take-it-or-leave-it offer to Canada to join the agreement by Friday, which has also raised the anticipation level on the prospect that trade tensions are going to ease. However, I would characterize the US-Mexico deal as a useful step towards a comprehensive NAFTA agreement, but the characterization that a deal as imminent is a high risk strategy for Trump that may backfire on him. Here are the main risks to a comprehensive agreement. On the verge of a "good overbought" rally, or market stall? 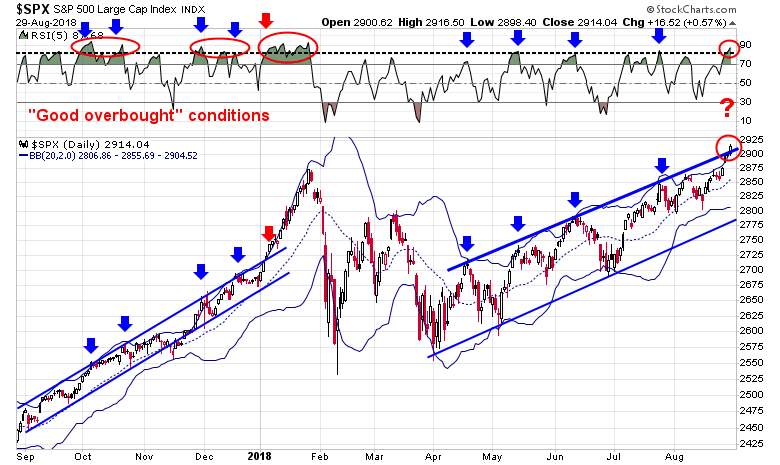 Mid-week market update: As the market broke out through the round number 2900 level, I am indebted to Urban Carmel and others for pointing out that the index is testing a key uptrend line. By definition, all episodes either tested or approached trend line resistance. Most were at or above their upper Bollinger Bands (BB). Each upper BB ride lasted between 1 and 4 days. Today is day 3 of the upper BB ride. All were overbought on RSI-5, with readings of 80 or more. The key difference between the rallies in 2018, and the melt-up advances that began in late 2017 is the degree of positive breadth participation. The 2017 episodes were marked by strong breadth and momentum that exhibited themselves in a series of "good overbought" RSI-5 readings. The strong display of momentum enabled stock prices to rise even further and in a steady manner. The key question for traders is whether the current rally turn into a "good overbought" advance, or will it stall at trend line resistance? I am late on this analysis, but I spent some time on the weekend reading, and re-reading Powell's Jackson Hole speech. Contrary to the market's interpretation, I concluded that his speech was not as dovish as the market thinks. 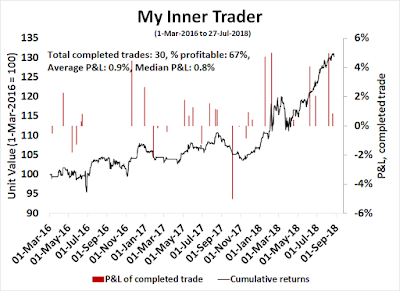 My inner trader uses the trading component of the Trend Model to look for changes in the direction of the main Trend Model signal. A bullish Trend Model signal that gets less bullish is a trading "sell" signal. 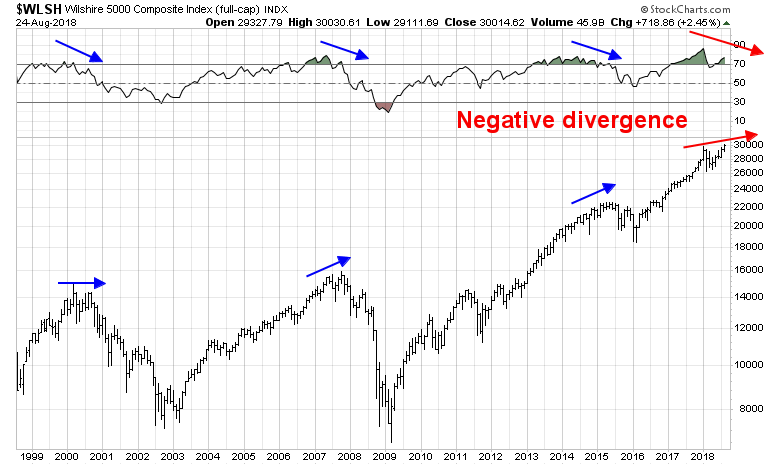 Conversely, a bearish Trend Model signal that gets less bearish is a trading "buy" signal. The history of actual out-of-sample (not backtested) signals of the trading model are shown by the arrows in the chart below. The turnover rate of the trading model is high, and it has varied between 150% to 200% per month. * The performance chart and model readings have been delayed by a week out of respect to our paying subscribers. I continue to get resistance to my recent bearish calls (see Major market top ahead: My inner investor turns cautious), and that was even before the major indices broke out to fresh record highs. To reiterate, the cautiousness was triggered by both technical and macro considerations. Most importantly, the Wilshire 5000 is exhibiting a negative divergence on the the monthly chart, which has foreshadowed important market tops in the past. As well, a number of my Recession Watch long leading indicators are rolling over. While the current snapshot forecast for the next 12 months remains neutral, at the current pace of deterioration, they would become sufficiently negative to flash a recession warning later this year. This would indicate that a recession would occur in Q4 2019. 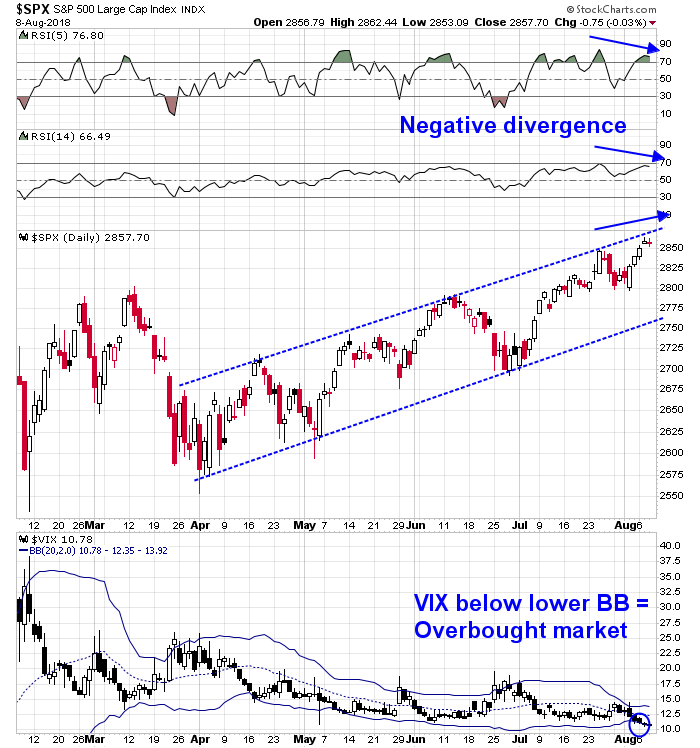 As stock prices tend to be forward looking, the combination of bearish technical readings and weakness in long leading indicators suggest that a market top is forming about now. In addition to the bearish technical indicators I cited three weeks ago, a number of other warnings have appeared indicating intermediate term cautiousness for equity investors. Mid-week market update: There was a lot of skepticism in response to my last post (see How many pennies left in front of the steamroller?). Much of it was related to comments relating to positive market breadth. 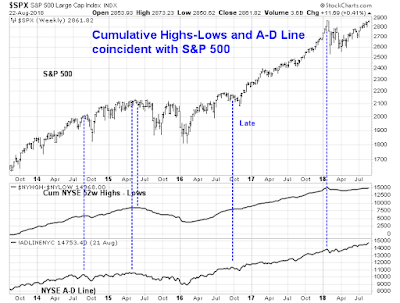 I am in debt to Urban Carmel who pointed out back in May that the Advance-Decline Line tends to move coincidentally with the major market indices. 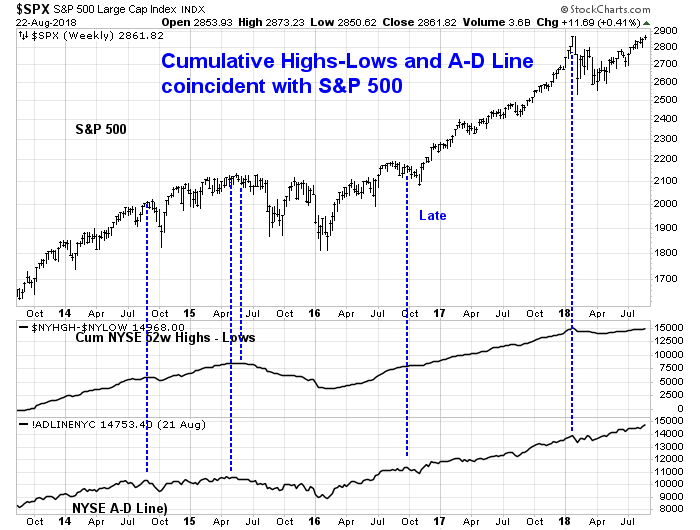 Here is an updated five-year chart of the 52-week highs-lows, and the NYSE Advance-Decline Line. The peaks in both of these indicators have either been coincidental, or lagged the stock market peak. How many pennies are left in front of the steamroller? A reader commented on the weekend, "TBH, being long here sure feels like picking up pennies in front of a steamroller". I agree. While I have been steadfast in my belief of a "Last Hurrah rally" before a significant market top, that scenario is looking far less likely. 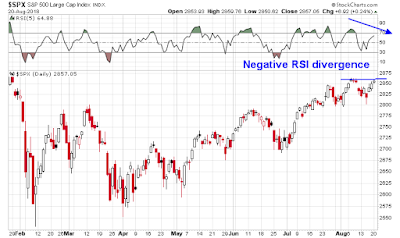 As the market tests a key resistance level, it is displaying both a negative RSI-5 divergence, which is tactically bearish, and faltering internals, which is intermediate term bearish. 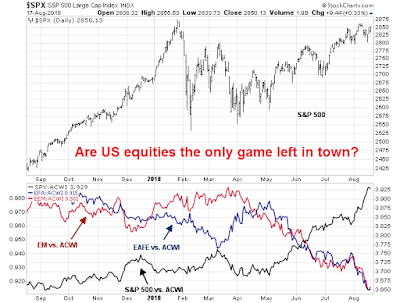 There is a distinct possibility that we may be seeing a final market top in the major US equity indices this week. 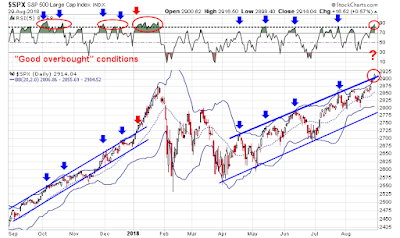 While the market may rally to new marginal highs, I believe that the risk/reward ratio is turning unfavorable for the bulls, and there may not be many pennies left on the road in front of the steamroller. Could China take the baton if the US growth falters? Good investors always examine their assumptions. What if I am wrong? What are the risks to my forecasts? I had lunch with a friend where he pushed back on my bear case for a major market top (see Major market top ahead: My inner investor turns cautious and How far can stock prices fall in a bear market?). The macro scenario goes something like this. The Fed is on track to steadily raise rates by a quarter-point every three months. Monetary indicators, such as money supply growth and the yield curve, are on a trajectory to flash recessionary signals by year-end, if not before. The US sneezes and slows into a mild recession, China catches a cold and collapses into a hard landing because of its excess leverage. Global contagion spreads into a global synchronized recession whose magnitude could be as bad as the last financial crisis. Already, the global outlook is precarious. 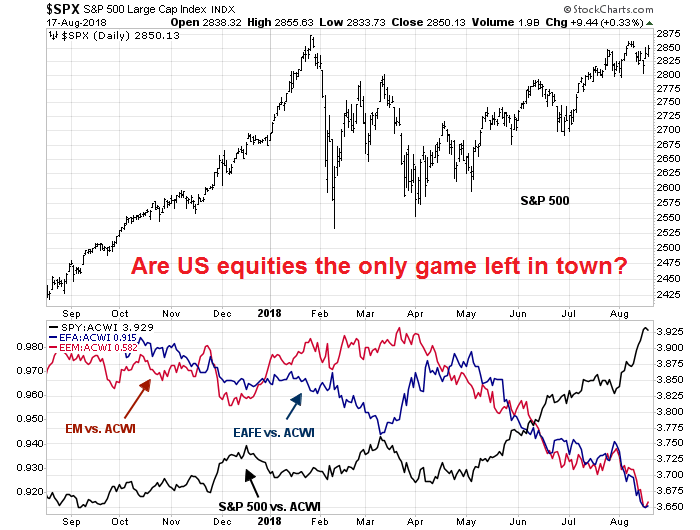 US equities seem to be the only game left in town as everyone piles into them. To be sure, the US is the last source of growth left standing. LPL Financial found that while US earnings expectations are still rising, they are flat for non-US developed markets (EAFE), and falling in the emerging markets. Sure, America is leading the world, but if the US slows, what happens then? My lunch companion's key objection to the bearish scenario is the China linkage. It is unclear whether a slowing American consumer will trigger a significant slowdown in China. Even if Chinese economic growth were to slow, Beijing still has lots of policy levers to cushion a downturn. This is an important question. 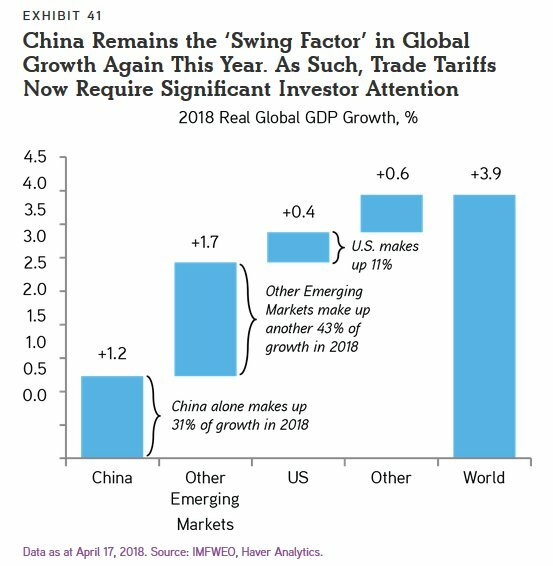 China remains the big swing factor in global growth. What if China doesn't collapse? The downside risk to my bearish scenario would be very mild by comparison. If US growth were to falter, could China pick up the baton? And it’s not just 20-20 hindsight for me to point this out now, with a strong bull market under our belts. On the contrary, in a series of columns beginning in March 2010, I regularly pointed out that the stock market usually takes currency and sovereign debt crises very much in stride. I based my confidence on how the stock market had reacted previously to other such crises over the prior two decades. The crises on which I focused were the 1994 Mexican peso devaluation and associated crisis; the Thai government debt crisis 1997 (which led to the term “Asian contagion”); the 1998 Russian ruble devaluation in August 1998 (which led to the bankruptcy of Long-Term Capital Management), and the 2001 Argentine government debt/currency crisis. 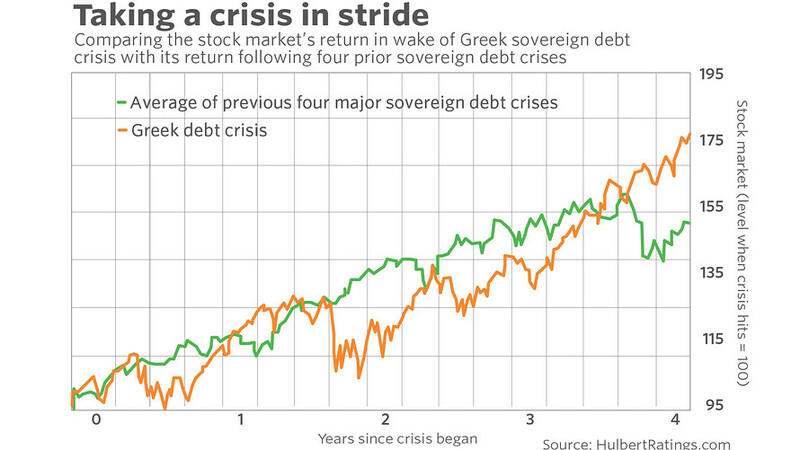 The accompanying chart shows how the U.S. stock market—on average—reacted to these four crises. For both data series, 100 represents the stock market’s level when those crises first broke onto the world financial scene. 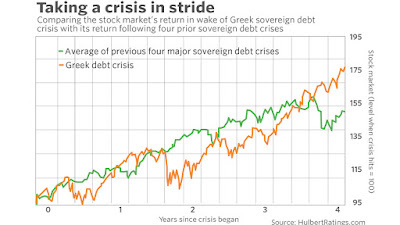 Notice that equities’ reaction over the four years following the Greek crisis was remarkably close to the average of its behavior in the wake of the previous crises. I agree. In addition to Hulbert`s points, there are two other reasons why the Turkey Tantrum will blow over. How far can stock prices fall in a bear market? One of the most frequently asked questions from last week's post (see Major market top ahead: My inner investor turns cautious) was my downside objective for stock prices. While technical analysis could highlight a possible trigger for a bear phase, it is less reliable for quantifying downside risk. Assuming the trigger for a bear market is a recession, one way to guesstimate downside risk is to examine how the historical record of stock prices behaved in past recessions. 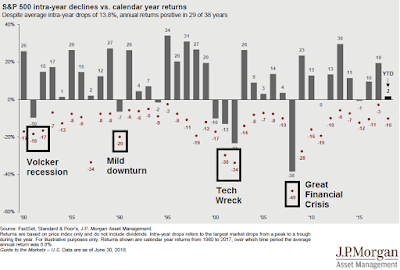 Beginning in 1981-82, that bear market was particularly nasty because it lasted over a year, and it was triggered by the Volcker tight money era. The 1990 bear market and recession, which was ostensibly triggered by the Iraqi invasion of Kuwait, was mild. The Tech Wreck in the aftermath of the NASDAQ Bubble in 2001-02 was also painful, but was preceded by an unprecedented surge in stock prices. The bear market of 2008 was short and sharp, but stock prices fell roughly 50%. 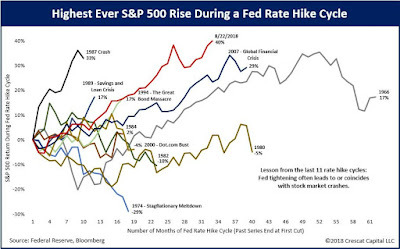 In conclusion, the historical record indicates that downside risk is in the 20-50% range. I received a lot of feedback from my post last week (see Major market top ahead: My inner investor turns cautious), mostly because it represented a major change in investment outlook. I would like to clarify a point that the post did not represent a sell signal for stocks, but the setup for a sell signal. In the short run, the market gods have given investors two gifts. First, the evolution of the Turkish Tantrum provides investors a glimpse at what a real EM blow-up might look like in the future, especially if China were to undergo a debt crisis. In addition, the path of least resistance for stock prices is still up for the next few weeks. Any rally therefore represents a second gift from the market gods. Investors can take the opportunity to lighten up their equity holdings in anticipation of long-term market weakness. 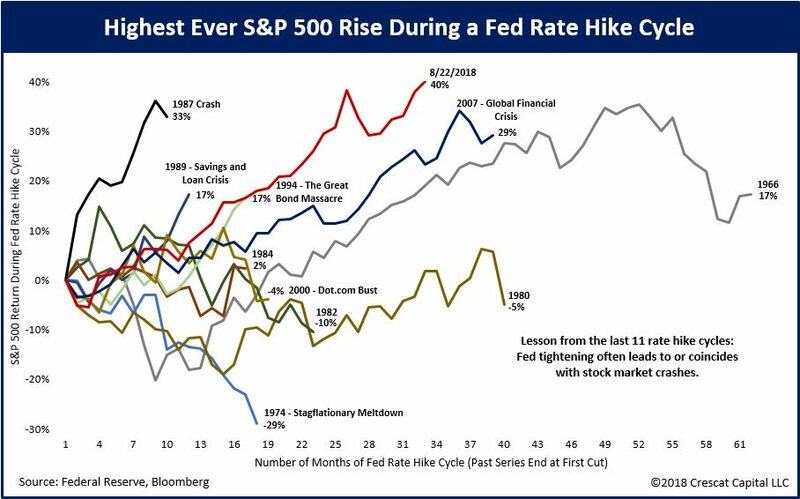 There have been plenty of warnings that US equities are topping out, starting with how monetary policy is affecting both Wall Street and Main Street. The latest Turkish inspired sell-off just provides another point of bearish pressure. Even before Friday`s market blow-up, the fault lines were starkly revealed when the Deputy Prime Minister of Turkey tweeted a complaint about Fed policy. In light of Friday's above consensus core CPI print, the Fed is likely to stay on their preset course of a quarter point rate hike every three months. Already, the Turkish lira crisis has sparked an upside breakout of the USD Index. If the breakout holds, it will spell trouble in other quarters. In addition to the pressure on other vulnerable EM currencies, a rising USD depresses the Chinese Yuan (CNY) and raise the specter of a currency war. 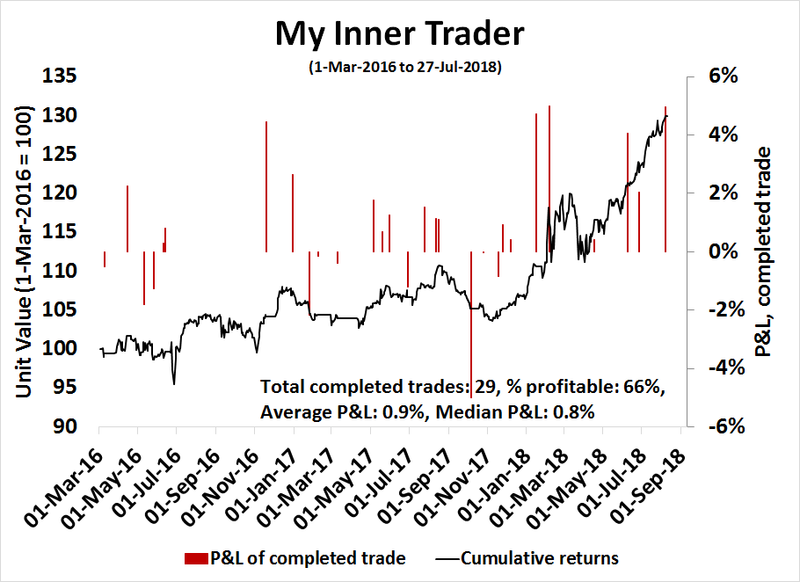 Mid-week market update: My inner trader remains constructive in his bullish view for stocks, but the recent advance appears to have gotten ahead of itself. My trading models indicate a 2-4 day period of weakness, followed by continued strength into all-time highs. 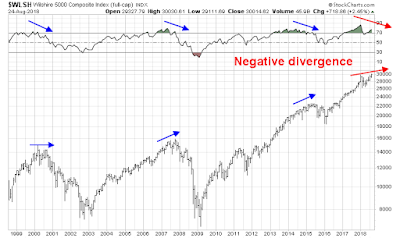 In the short-term, the market is flashing cautionary signals for traders. 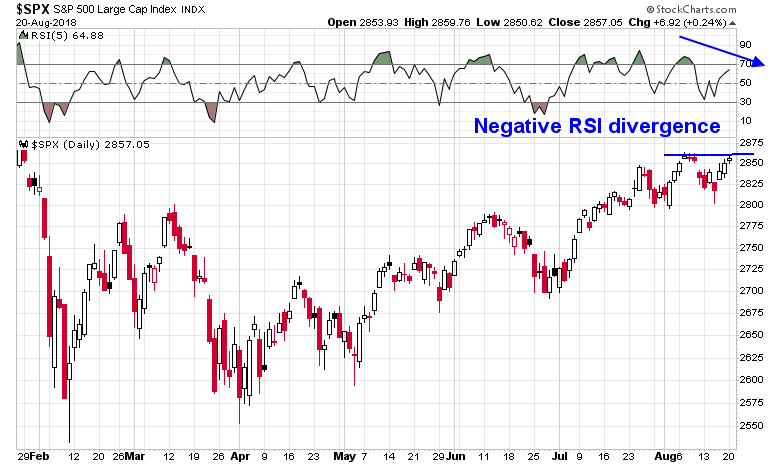 The SPX is exhibiting negative RSI divergences as it broke out to new recovery highs. 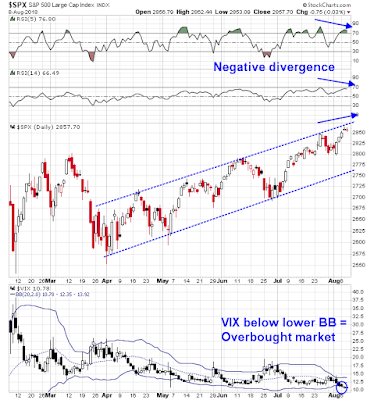 As well, the VIX Index breached its lower Bollinger Band for two consecutive days, indicating an overbought market. 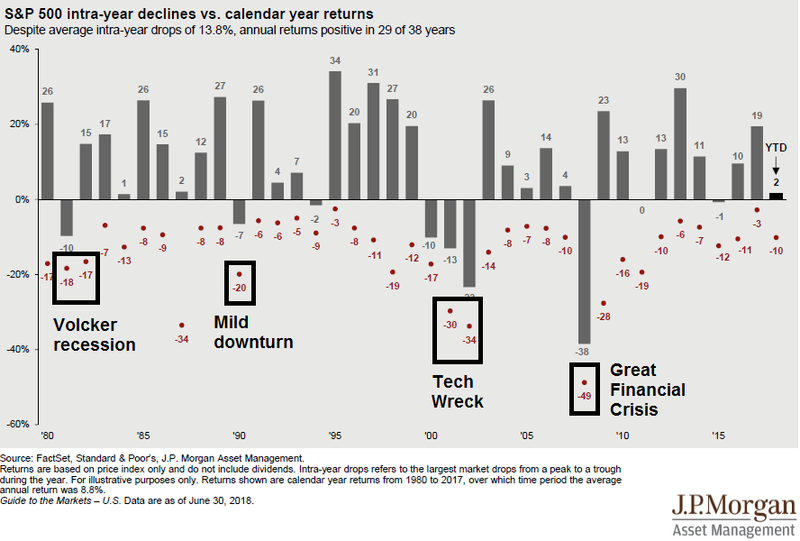 Historically, such conditions have led to market weakness lasting 2-4 trading days. If history is any guide, a short-term trading bottom is most likely to occur either Friday or Monday. As the stock market enters the late stages of its bull run (see my last post Market top ahead? My inner investor turns cautious), inflation hedge vehicles typically rally as inflationary pressures rise. We are starting to see a similar effect in gold prices. 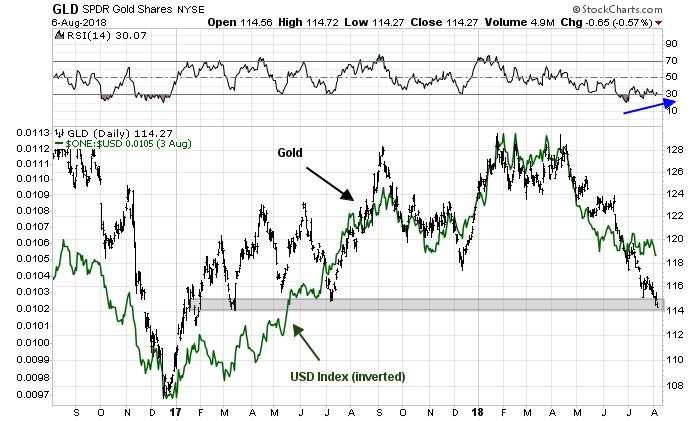 As the chart below shows, the recent weakness in gold prices can largely be attributed to USD strength (green line, inverted). One constructive element for the gold price outlook is the positive RSI divergence as the price tests support. My formerly bullish inner investor is turning cautious. This major change of opinion is not without precedence. The chart below is a record of my investment calls, and it shows that I have been neither a permabull or permabear. I was correctly bullish when the stock market dipped in 2015, and I turned cautious in the first half of 2015, and in early 2018. I am now seeing the early technical signs of a developing cyclical top for the bull market that began in 2009. 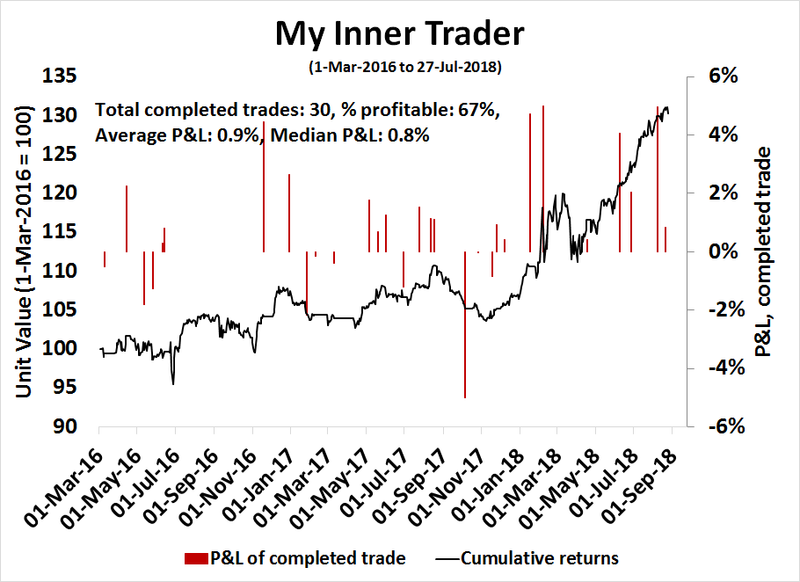 While this is not a call to sell everything as a bear market can take some time to develop, my inner investor is taking steps to rein in his risk exposure in preparation for a market top in the next few months.